This could be easy, might be difficult … I’m not sure — simply comment below explaining this photograph. UPDATE: This was a tough one. I was on a field trip last weekend and as soon as I saw this feature I instantly knew I’d make it a great geopuzzle. A few of the commenters speculated about this being some kind of collapse feature. That is exactly what it is — but the part of the story that you might not have guessed is that the collapse happened since the 1860s. This is from the Black Diamond coal mine (inactive since the early 1900s) near Antioch, California. The coal seam was removed and the overlying sedimentary rocks collapsed into the space. The dark material is bits of pieces of the lignite coal left. Even though I knew what this was when we came across it (as our guide pointed it out), I was amazed how similar it looked to other soft-sediment or local-collapse deformation features I’ve seen from the geologic record. To see more photos of this mine, check out my Flickr set here. Soft sediment deformation due to dewatering? At the risk of being laughed at, I can only say that the finely layered sediments seem to have been disrupted by a roundish, carbonised object. Would the fine layers be lake sediments and would the carbonised object be a tree bole. Is this picture upside down? Otherwise, I’d say these must be disrupted turbidites, and wonder if there isn’t some kind of diapirism going on with the lower seds. 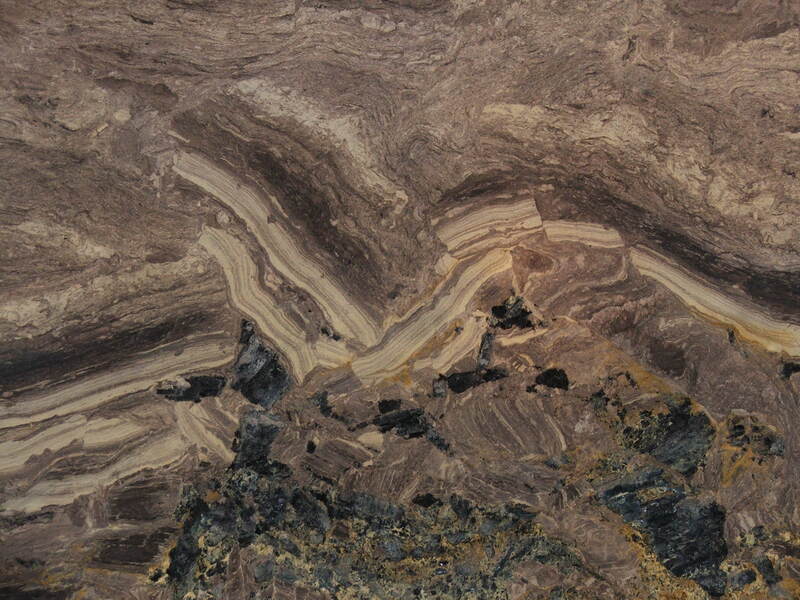 What are those lower, dark clasts – and is there oil in the matrix of the lower breccia or just in the clasts? Hey! I saw that picture on the daily “geology photos on Flickr” post (yesterday?). Chris … no scale is part of the puzzle! Kim – yes, that is my photo on Flickr, but if you go there it’ll give the answer (I should’ve waited to upload it there). For those that still want to play, firstly, don’t go to Flickr :) … secondly, most have noticied the seds are disrupted, but no one has correctly stated the cause of that disruption. I’m going to go with a paleokarst breccia interpretation. Ron Schott made the guess I was going to make… but I’ve got some problems with it. First, the sediments do appear to have been somewhat soft when disrupted, and second, the two sides seem to have converged. That is, there appears to be shortening accross the disrupted zone. That could happen in a cavern collapse, but it doesn’t look right. I’ll give it at least a few more hours … this is a good one! Glad I wasn’t standing there, whatever happened! Is it a result of soft-sediment (partially lithified) deformation from an underwater slump? The black layer looks like petroliferous shale (this is arm chair geologizing taken to the next level). I agree with Lockwood. The manner in which the laminated crust (caliche /supratidal?) has been broken up seem to suggest shortening. I call shenanigans! A scale would have greatly helped, it is still unclear how large the feature is. Shoulda figured the black stuff would be coal, since you were twittering about your visit to Black Diamond. Ron Schott made the guess I was going to make… but I’ve got some problems with it. First, the sediments do appear to have been somewhat soft when disrupted, and second, the two sides seem to have converged. That is, there appears to be shortening accross the disrupted zone. That <i>could</i> happen in a cavern collapse, but it doesn’t look right. Just broke into geology as a hobby! Definately water related erosion however the blck coal like fragments tell me that this erosion is over along period of time aka in the millions of years. Pete … look at the update, this is collapse due to mining.